Skeletal Models There are 30 products. Skeleton Model Human Full *Oversize*. 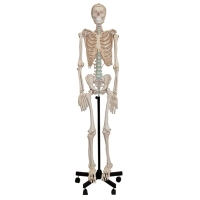 This life-sized detailed skeleton of an adult male is made of bonelike plastic material and is extremely durable. It is hand-assembled to ensure the accuracy and detail you require in your classroom. Main joints are articulated and upper and lower limbs are easily removable. A good basic unit at an excellent price. Roller stand included. Height: 170 cm Weight: 10 kg This item ships oversize. Oversize fees will be added to your shipping. 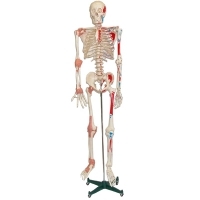 Skeleton Model with Muscles. (Ships In 2 Boxes, 1 Oversize). This deluxe model was meticulously hand-painted and features the muscle area. Made of bonelike plastic material and hand-crafted to provide intimate details. It features articulated main joints with removable upper and lower limbs. The left side shows the points of origin (red) and the points of insertion (blue) of the muscles. Height: 170 cm Weight: 10 kg This item ships oversize. Oversize fees will be added to your shipping. Skull Model, Natural Size 3 Pc. 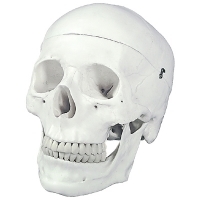 This life-sized cast replica of an adult male's skull includes all of the structural details. The skull cap is removable and the internal structure can be viewed. All joints, sutures, fissures, foramina, and processes are depicted. 22 x 14 x 16 cm. 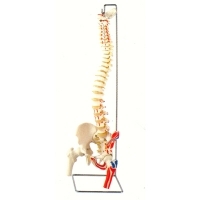 Weight: 950 g.
Spine Model, Flexible with Nerve & Artery. This life-size model of a vertebral column has realistic flexibility. 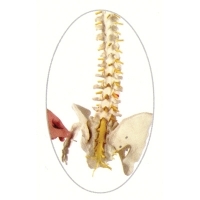 It includes the occipital plate; cervical; thoracic and lumbar vertebrae; sacrum; coccyx; and complete pelvis. The vertebral arteries, spinal nerve branches and prolapsed L3 - L4 intervertebral disc are represented. The spine is free standing and suspended from a stand. 90 x 20 x 20 cm. Weight: 3 kg. Spine Model, Flexible with Open Sacrum. The back of the sacrum on this fully flexible model opens to expose the sacral portion of the spinal cord and associated nerve branches. 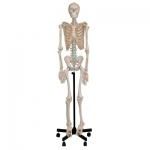 Includes occipital plate, cervical, thoracic and lumbar vertebrae, sacrum, coccyx and complete pelvis. Vertebral arteries, spinal nerve branches, and a prolapsed L3 - L4 intervertebral disk are represented. Stand not included. 90 x 20 x 20 cm. Weight: 3 kg. Spine Model, Flexible with Femur Heads/Muscles. 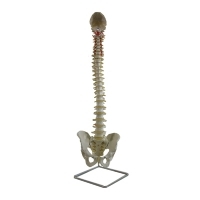 This fully flexible spine includes the pelvis, occipital plate, cervical, thoracic and lumbar vertebrae, sacrum, coccyx, complete pelvis with symphysis, and removable femur heads. Vertebral arteries, spinal nerve branches and prolapsed L3 - L4 intervertebral disc are depicted. The left side of the skeleton shows the points of origin (red) and points of insertion (blue) of the muscles.